Musicals usually begin with a few minutes of theme music that is a summary of what the audience will hear during the show. 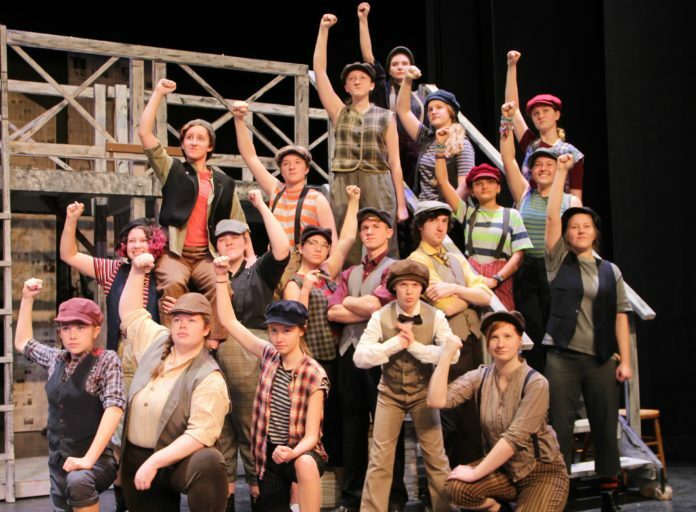 In Thursday’s show, “Newsies”, that the Kemptville Youth Musical Theatre Company [KYMTC] put on for schools, this music was exciting and had the students in front of me bouncing in their seats. The first time the full chorus sang, I smiled, because I was hearing such a vibrant, energetic sound from actors who obviously enjoyed what they were doing. Then there was the dancing. Wow! Choreography and dancing are every bit as impressive as the singing with this cast. They are full of life. The story shows the huge contrast between the lives of the newsies and a newspaper owner, Joseph Pulitzer. The newsies are young, mostly orphan, boys who line up each morning to buy their usual quota of newspapers that they hope to sell on the streets through the day. Pulitzer has his custom barber attend him in his wood-paneled office while he claims to support striking transit workers, but complains that the newsies should pay him more for his papers. It really gives you a sense of the reality of doing piece work for a ruthless employer. The sets are impressive in their simplicity and in their size, representing multi-story buildings in New York. Much of the setting is poor rental accommodations and the shipping area of a large newspaper. Some scenes have large, beautiful paintings of what Jack Kelly dreams of around Santa Fe, New Mexico. Watch for the clever use of projection that shows off Jack’s artistic talent while he argues with Katherine. The production is fast-paced, with scene and set changes occurring while the story unfolds. 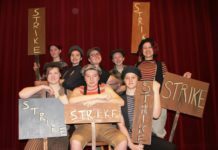 The audience is repeatedly reminded of the multiple disadvantages suffered by newsies in 1899 in their struggle to earn a decent wage and a secure future. The determination of the establishment to retain their power is a big factor. Musical Director, Phillip Konopka’s talent is obvious, as he plays two different keyboards and has coached great singing from these young actors. This production has a mixture of solo, small group, and large group performances which are in tune and display good harmony. The dancing gets more impressive as the story progresses. Brothers Davey (Dominic Belhumeur) and Les (Shannon Fayer) as the newest newsies are outstanding. Katherine Plumber is delightful, as played by Tatum Tatarciuc. 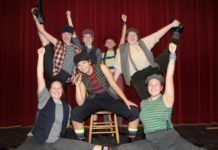 Crutchie, the crutch-wielding newsie, is well-played by Hannah Grosskleg. Roles of one of the newsies, called Race, who smokes cigars, and the saloon singer, Medda Larkin, who helps Jack, are played very impressively by Azaria Shams. You will also be impressed by the acting, singing and dancing of the leader of the newsies, Jack Kelly, played by Nathanael Flinn. Major kudos go to the production team and outstanding cast. This amazing production runs at the Urbandale Arts Centre (North Grenville Municipal Centre) on the weekends of April 5 and 12. Tickets are available at Scotiabank, or online at www.kymtc.org.